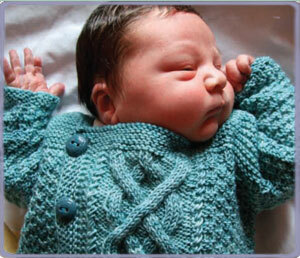 “Baby Yours” is a sweater I designed for a friend expecting a baby of an unknown gender. I decided I would knit two, one for each possible outcome, and this is the sweater that resulted in the boy category. Baby Yours is designed to flatter a baby’s roundish figure, and be very easy to put on. It has deep armholes, extra width, a square neckline, and an offset closure. (The buttons off to one side are really just for flair.) It’s intricate enough to become an instant heirloom, but not so fussy that knitterly tears should be shed. I think it would be just as charming for a daughter as a son.